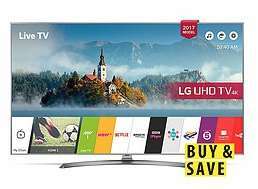 LG 49UJ750V 49 inch, 4K Ultra HD £629 not sure if its good but its lg's mid range and its £750 in tesco, amazon and currys, so... not bad for 629 plsu finance available... i was looking at the samsung MU7000 or LG 55SJ850v trying to decide between them both but this is only slightly worse in specs and is very cheap compared so... hope it helps someone? I think this same model or the 43" variant was going for £499 yesterday from JL. I this same model or the 43" variant was going for £499 yesterday from JL.